The new and completely redesigned website offers visitors richer insight into Integra’s compelling capabilities in die preparation, packaging, assembly, test, reliability qualification, Destructive Physical Analysis (DPA) and Failure Analysis (FA) services for high-reliability applications. 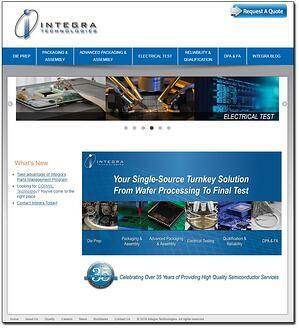 Wichita, Kansas, September 5, 2018: Integra Technologies, a global provider of semiconductor services for high reliability applications, serving mission-critical applications where dependability and failure-free performance are paramount, announced today the launch of its newly revamped website. This newly redesigned website offers quick and easy access to essential information and features that offers a more comprehensive understanding of Integra’s compelling services. No other competitor in the industry offers the full range of end-to-end solutions to the Hi-Rel market than Integra Technologies. Extensive breadth of services remains a key differentiator, as customers continue to consolidate their supply base and seek vendors that can provide a one-stop-shop platform. The website includes service offerings from Integra’s most recent acquisition of CORWIL Technology, Milpitas, CA, in September 2017. The new website has a clean uncluttered design, improved functionality and enhanced rich content focused on the Company's mission to provide its valued customers with unapparelled full-turnkey capabilities of die preparation, packaging, testing and characterization of Hi-Rel semiconductor components and related value-added services. The new website went live, on August 6, 2018 and is located at the same address: https://www.integra-tech.com/ . "We are excited about our new website launch and the robust information it provides for customers to better understand Integra Technologies’ best-in-class full-turnkey services," said Brett Robinson, Integra Technologies President & CEO. "We believe that this new site will allow our visitors to have a very informative experience as we continue to grow and increase our market presence." Integra Technologies new website will be updated on a regular basis. Visitors are encouraged to explore the website and send all sales inquiries to sales_inquiry@integra-tech.com .